When you first join, you don’t need to bring anything other than water and comfortable clothes as we have dojo swords that you can use. Like any other sport, it is recommended that you purchase your own equipment as you continue. The Cotton Basic set comes with Dogi, Hakama, and Obi, and will be perfect for our class. 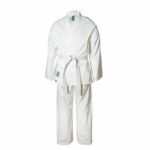 The Ultra Light set comes with Dogi, Hakama, and Obi, that will provide you a more comfortable uniform. 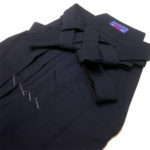 If you are interested in ordering a Hakama on its own, you can do so at AOI-Budogu or through Jukado. 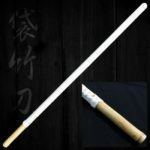 Please make sure to order an Iaido Hakama as they are constructed a bit differently to allow for sitting and kneeling techniques. You will also need to purchase an Obi (belt) to wear under the Hakama. I recommend getting an Iaido Obi as it is an appropriate thickness and Length. If you’d like to order a Hakama and Obi through me, I can order them at a discounted cost from Jukado. Traditional Karate Uniform – a mid-weight uniform (9oz) that includes a white gi, white pants with a drawstring, and white belt. This is a standard Karate uniform made of 100%. If you want to order this, contact me as I may be able to get it at a discounted price. 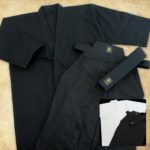 Karate Uniform – this mid-weight uniform is less expensive as it is made of 50/50 Cotton/Polyester. Additionally, the pants have an elastic band. The elastic waist is convenient, but if the elastic wears out or breaks, the pants will need to be replaced. If you want to order this, contact me as I may be able to get it at a discounted price. Basic Karate Uniform – the most affordable karate uniform that includes a white gi, white pants, and white belt. It’s lightweight (7oz) so it will not be as durable, however because we don’t do much grappling or throwing techniques, it should be ok. I think it’s 40/60 cotton/synthetic. If you want to order this, contact me as I may be able to get it at a discounted price. The Yagyu Shinkage Ryu style practices with Fukuro Shinai. This unique type of sword is made from a piece bamboo that has been split at one end, covered in leather. 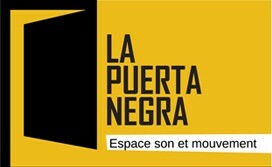 They are available from AOI-Budogu (Canada) or E-Bogu (USA).